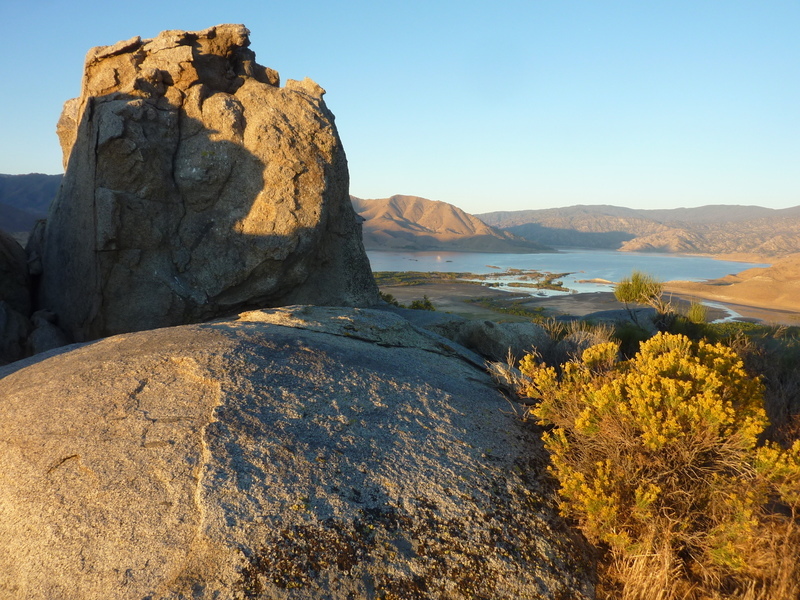 I was to meet Tom and Matt around noon in Lake Isabella (the town) for some afternoon Jeeping and light peakbagging in the Piute Mtns south of town. I'd spent the night camped in the van on the north side of the lake to do some easy peaks in the morning before meeting up. We didn't get to all that I had envisioned for our visit to the Piutes, but it was a pretty full day nonetheless. This small summit lies on the NE side of Isabella Lake (the reservoir), less than half a mile from the road. An unsigned cattle fence lines the property where I approached from the east side. It was easy to breach and only a short hike to the open summit through a mix of grass and rocky terrain. A squat class 3 summit block adorns the top with views overlooking the lake and the Kern River Valley. Located three miles to the northwest of Peak 3,193ft, these two summits lie on BLM lands on the north side of the lake. Cattle graze the area, but it appears the public is welcome to explore the area both in vehicles and on foot. A sign on the unlocked gate at the pavement asks politely that the gate be kept closed. The road leads to a telecom tower on Peak 3,577ft where there are also the concrete foundation pillars of a lookout tower that once stood nearby. I first visited the higher but unadorned Peak 3,828ft before wandering over to the lower summit which has better views of the lake. I finished by dropping directly off the summit to the southeast back to the van near the gate to make a loop of it. This small point marks the confluence of the North and South Forks of the Kern River at the meeting of the two main branches of the lake. It appears to be a small, private inholding within the lake's surrounding recreation area managed by the Forest Service. I approached from the road to the east, following the shoreline around Rocky Point Bay before climbing the short distance up to the summit. A home can just be seen to the north which has a dirt road access coming from a day-use area further north. A class 3 block near some trees marks the highpoint in a nice setting half-surrounded by the lake, a very pleasant place to while away some time. I returned via much the same route, all the time wondering if any part of the route I used was actually open to the public (a fence along the roadway needs to be breached, but there are no signs indicating it is off-limits). It was 11a by the time I returned to the van and with a 45min drive back to Lake Isabella, I was pretty much on schedule for meeting up with Matt and Tom. Matt arrived in town on time but we were delayed by LA traffic that held Tom up for another half hour or so. Once we had our act together, we piled into Tom's Jeep and headed up Caliente-Bodfish Rd to the saddle above Bodfish where we turned left onto unsigned Piute Mtn Rd. We found the dirt Piute Mtn Road in decent shape but not suitable for low-clearance vehicles, Tom commenting that it was rougher than he'd last remembered it. It is one of three main roads driving into the Piute Mtns and is often used by peakbaggers to access the HPS Bald Mtn Peak a few miles up the road. Sunset Point is found about 3.7mi ESE of Bald Mtn Peak and a very short hike off a spur road that we followed to within about 100yds of the summit on its west side. Easying hiking through open forest leads to the rocky summit area where we climbed atop the class 3 granite blocks. Trees on most sides made for poor views in most directions. A slightly lower block that was a bit more challenging is found a short distance to the north. In a sporting mood today, this was the first of several such extraneous blocks Matt would climb while we were visiting the various summits throughout the afternoon. Another 1.7mi SSE rises Liebel Peak. A signed spur road forks north off the main road to take one to the trailhead, about 3/4mi from the summit on its south side. The trail appears to see equal amounts of motorcycle and boot traffic, winding its way along the east side of the ridgeline through partially burned forest before reaching the class 3 summit block. A bit more challenging, this summit is more open to views overlooking the Piute Mtns and features a register dating to 1992 when Ruby Jenkins was scouting peaks for the second edition of the Southern Sierra guidebooks. The last visitors to sign the register were Laura Newman and Greg Gerlach, no great surprise there. On our way back Matt found another side project to occupy him for a few minutes, the whole outing taking us just under an hour. Another half hour's driving saw us to the northeast side of 8,000-foot Brown Peak, only a few hundred yards from the summit. The hike went steeply up through forest understory, eventually emerging at the summit where there is a decent and unexpected view overlooking Walker Basin to the southwest. Barbara and Gordon had left a register here in 2005 and there were already 11 pages of additional entries since then. We noted several motorcycle trails on the way up, the area apparently riddled with them and a popular way for folks to visit this and other points in the range. Two miles to the southeast and a few hundred feet higher is this unnamed summit, another short hike off a spur road. It took all of 8min to reach the rocky summit which offered another place to look out over the Piute Mtns. Higher and more prominent than Brown Mtn, it nonetheless garnered no similar love from the Lilley/MacLeod duo with no register to be found. Our last stop of the day was atop Piute Lookout in the middle of the range. Tom and I had both previously visited this HPS summit, easily reached via Jeep with only a modest walk to the rocky highpoint where a lookout tower once stood. It has the best views of all the peaks we visited today, looking over a wide swath of the range and beyond on a fairly clear day. I was hoping to visit Inspiration Point and possibly a few others, but it was already 5p and we were running out of daylight. We drove back to Lake Isabella to retrieve our other vehicles, had dinner in Kernville at the brewery there, then drove another hour into the Southern Sierra and Poison Creek where we would spend the night. Iris and Scott drove up not long after we had arrived, bringing our party of five together before the next two days' adventures.